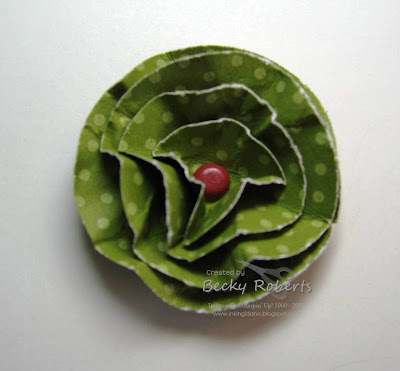 I'm having fun making all kinds of these paper flowers! 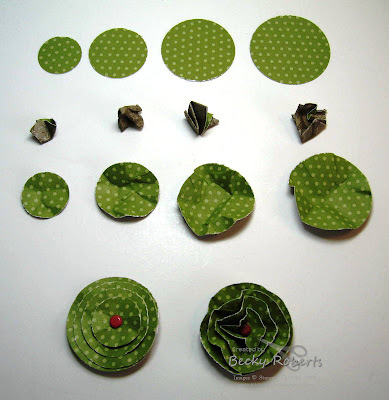 How to make the flowers: Punch a circle from the 4 circle punches. Crumple them up nice and tight, it's ok if they tear slightly. Unfold them and layer onto each other. Pierce with a hole and insert the brad. Fluff them up a little! 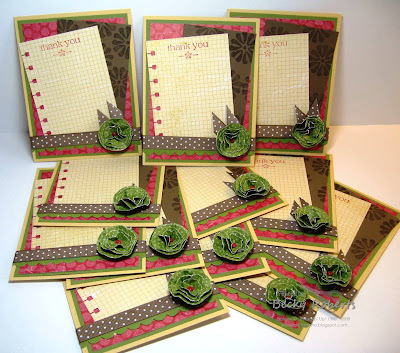 These are note card style card fronts for thank you cards. size 4-1/4" x 5-1/5". Sometimes I look up and see the funniest things! That Eric!! I got a kick out of your Eric. My Riley could be his twin and loves to curl up in boxes too! So cute! I love it so much ,he looks so cute. I love the flowers. Thank you for sharing! love the cards and the flower is way cool. What a familiar sight-the cat in the box instead of the cat in the hat! My cat loves to get in the SU boxes also and the expression on his face is so typical- kinda like "why don't I fit?"!! Lovin' it! Cute flowers! I am gong to have to make some. 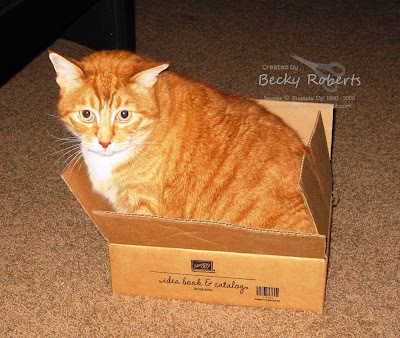 Everytime a Stampin Up box comes the cats think it is just for them. Makes no difference what size or shape and it is only the Stampin Up ones...girls with taste! Oh my--I miss having cats!! Love your thank you cards, too. I love everything about these note cards! !